Disclaimers: This post is riddled with spoilers for both Lord of Shadows and previous books by Cassandra Clare. Jules, Emma – when are you going to get it into your thick heads that Cortana can cut through anything. Including the Parabatai bond. We figured it out in Lady Midnight and you killed legendary bronze people who are almost godly and shouldn’t be able to die. Like, seriously. Dru, darling, you’ve been neglected. You got far less time than the others and while we thought you’d die we’re happy you didn’t. ALSO, we thought Diana would get the chop and maybe Diego and Zara. Good god she needs to be stabbed. The Centurions are a collection of entitled idiots. If Mark doesn’t hurry up and decide between Christina and Kieran we will scream. Alternatively, we could maybe see the three of them working together…but maybe not. Jamie! JAMIE. Why aren’t you the evil, scheming wretch we were hoping you’d be? Why do we have emotions for you? Positive ones. Not even stab, stab, stab emotions. Oh my god, Julian. Your baby Livvy is dead. We will never recover. It’s like Margaery going up in Hellfire in Game of Thrones all over again and we can’t cope and what about Ty and what about Kit. THERE WAS FRIENDSHIP BLOSSOMING. And by the Angel how will everyone be able to keep going. Where’s our kiss between dearest Tiberius and Kit? It isn’t anywhere, that’s where it is. Clary. Jace. You are so out of place in this book. Go home. We hate seeing you in novels that aren’t your own. We need more of Mark. He’s adorable. It’s easy to say that Lord of Shadows is a step up from Lady Midnight and that was good already. We’re proud of you Cassandra Clare. Lord of Shadows succeeded on many levels, but the main thing that concerned us, THE ONLY THING THAT CONCERNED US was Ty and Kit. They are the future. They are what mankind should aspire to be like. Side note: We are also what mankind should aspire to be like. Okay, so…where do we start? The second book in The Dark Artifices trilogy took on a global feel ala Sense8 and really explored the interconnecting worlds of Faerie and regular old Earth where human angels endeavour to drive back demons and make sure disgusting undead sea demon warlock hybrids don’t eat little children. Yes, Malcolm we’re talking about you. We got to see the politics that influence how Institute Heads are appointed, the mechanics of Unseelie royalty where having fifty sons really means you’ll have a bag of extra bargaining chips to throw and spend at your disposal unless of course they kill each other. We got to see the ever-increasing hate that a great deal of Downworlders have for Shadowhunters be compacted into two sections. The actions of Shadowhunters and the attitude of Shadowhunters. Let’s discuss the attitude of Shadowhunters. Those who have drank from The Mortal Cup to be gifted by the angel Raziel are less likely to have the overwhelming arrogance of your average, I was born this was Shadowhunter. You’re regular Shadowhunter believes that they can do anything, that their way is the right way in most cases. Granted, there are exceptions, but as a whole they believe this. Even Emma and Julian think it’s okay to threaten Downworlders for information so long as it gets them where they want to be. It’s this attitude that has them looking down on Mundanes, being amused by Mundanes as if they are creatures in a zoo and distrusting anyone with fair folk blood. It’s this attitude that led to the Clave not bothering to try and rescue Mark and sentencing Helen to exile on a tiny, tiny island that is cold and miserable. It’s this attitude that has stopped Diana, fierce and gorgeous she’s rightly named after the Roman incarnation of Artemis, from helping the Blackthorns in the way she truly wants to (by becoming the Head of the Los Angeles Institute). In Lady Midnight, Cassandra Clare made it clear that Diana had secrets. AND FINALLY, WE GOT TO KNOW THEM. Diana was born Michael. She was born in a body that wasn’t her own. Diana is transgender, but that’s not what has stopped Diana from becoming the quintessential boss of all LA based Shadowhunters. At least that’s not what we got from what was written. What’s stopped Diana from it is the manner in which she became herself. She underwent operations don’t by mortal doctors, she went through the process of transitioning with Mundane professionals all around her. In a scene with Gwynn she explained that she chose to do so because of the permanence of it all. A spell can be undone by another spell and there was no way in heaven or hell that she was going to live with the chance that a wayward Warlock could turn her into something that wasn’t her. What’s nice about Diana’s complexity as a character and in particular the manner in which her hidden truths were revealed to us as readers was that none of it came across as a cheap gimmick. Cassandra didn’t place something so emotional and profound in Lord of Shadows because people demanded it, but because Diana as a character demanded it. It was well done and felt honest unlike certain other revelations that have happened in books we’ve read recently (ACOWAR). ONTO OTHER EMOTIONAL STUFF and back to the actions of Shadowhunters. Her betrayal of the glorious Blackthorn family is because of how long dead members of the family acted towards her. How they treated her and made her dead. Her betrayal is, in some ways a pre-emptive act that one may commit in war. And it is now War because Julian will kill her. He will make her suffer and we will cheer. Is it too much to say that although the actions of Shadowhunters have saved countless human lives, they have also caused them all the pain they’ve ever felt? Yes? No? We don’t think it’s much of a reach. The Circle came into existence because of Valentine’s superiority complex where Downworlders were concerned. Sebastian came into existence because the Clave didn’t do their jobs properly and wipe him off the face of the Earth. The Seelie Court aligned with Sebastian because they knew they’d never be treated as equals under the current rules. And now, with the Dark War having concluded in City of Heavenly Fire and the Cold Peace that we’ve already mentioned having been in place for five years, the Fae are demeaned and less. They are angry. They are vengeful and war is approaching because of Shadowhunter choices. 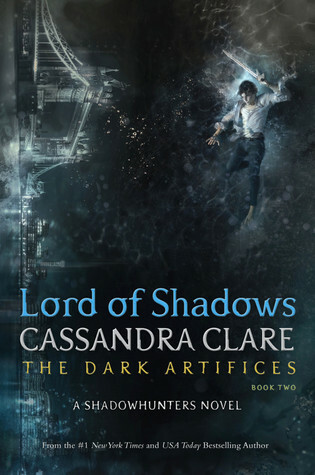 With Lord of Shadows, Cassandra Clare gave us so much to think about and we ended up writing a review in a different style to what we usually write because we just had to share some of our thoughts without being confusing and changing tone every few sentences. Over the space of the next two years, we’ll be reading this book multiple times and we can’t ever see us loving it any less than we do right now. So, what did you all think of Lord of Shadows? Did it exceed your expectations? Did it rip your fragile, mortal hearts out? Let us know in the comments! This entry was tagged autism, books, cassandra clare, demons, emma carstairs, fae, fantasy, fiction, julian blackthorn, kit, literature, magic, romance, seelie, shadowhunters, thoughts, tiberius blackthorn, unseelie, warlocks, young adult, young adult fantasy. Bookmark the permalink.